Como Estaras En 5 Años? Que debo hacer para comprar casa? 5039 Jarvis Ave Video Tour En Español !!! LOS ANGELES (Oct. 11) – A combination of high home prices and eroding affordability is expected to cut into housing demand and contribute to a weaker housing market in 2019, and 2018 home sales will register lower for the first time in four years, according to a housing and economic forecast released today by the CALIFORNIA ASSOCIATION OF REALTORS®’ (C.A.R.). C.A.R.’s “2019 California Housing Market Forecast” sees a modest decline in existing single-family home sales of 3.3 percent next year to reach 396,800 units, down from the projected 2018 sales figure of 410,460. The 2018 figure is 3.2 percent lower compared with the 424,100 pace of homes sold in 2017. C.A.R.’s forecast projects growth in the U.S. Gross Domestic Product of 2.4 percent in 2019, after a projected gain of 3.0 percent in 2018. With California’s nonfarm job growth at 1.4 percent, down from a projected 2.0 percent in 2018, the state’s unemployment rate will remain at 4.3 percent in 2019, unchanged from 2018’s figure but down from and 4.8 percent in 2017. The average for 30-year, fixed mortgage interest rates will rise to 5.2 percent in 2019, up from 4.7 percent in 2018 and 4.0 percent in 2017, but will still remain low by historical standards. 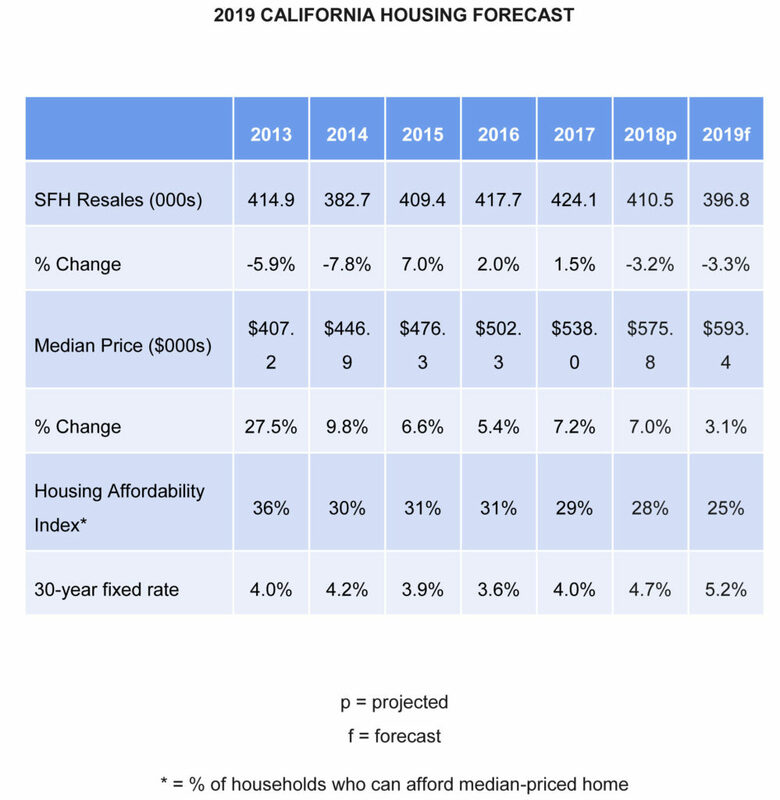 The California median home price is forecast to increase 3.1 percent to $593,450 in 2019, following a projected 7.0 percent increase in 2018 to $575,800. Outmigration, which is a result of the state’s housing affordability issue, will also be a primary concern for the California housing market in 2019 as interest rates are expected to rise further next year. The high housing cost is driving Californians to leave their current county or even the state. According to C.A.R.’s 2018 State of the Housing Market/Study of Housing: Insight, Forecast, Trends (SHIFT) report, 28 percent of homebuyers moved out of the county in which they previously resided, up from 21 percent in 2017. The outmigration trend was even worse in the Bay Area, where housing was the least affordable, with 35 percent of homebuyers moving out because of affordability constraints. Southern California did not fare any better as 35 percent of homebuyers moved out of their county for the same reason, a significant jump from 21 percent in 2017. The substantial surge in homebuyers fleeing the state is reflected by the home sales decline in Southern California, which was down on a year-over-year basis for the first eight months of 2018. Outmigration will not abate as long as home prices are out of reach and interest rates rise in the upcoming year.